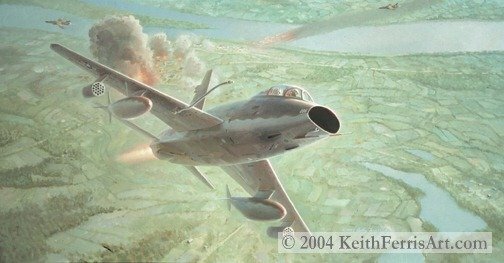 The destruction of the first Surface-to-Air-Missile site near Phu Tho, North Vietnam on 22 December 1965 by the F-100F 58-1226 flying out of Korat RTAB, Thailand. Pilot Captain Allen Lamb and Captain Jack Donovan, the Electronic Warfare Officer, are depicted flying F-100F numbered 58-11226 on the first successful destruction of a Surface-to-Air-Missile (SAM) site by a Wild Weasel Hunter-killer team near Phu Tho on the Red River northwest of Hanoi, North Vietnam 22 December, 1965.By exposing the aircraft to the SAM site, the Radar Homing and Warning signal in the F-100F located the site, evaded the missile and gunfire to attack the site with 20 mm guns and 2.75” rockets. Assisting the F-100F was a strike flight of four F-105D fighters with 20mm guns and rockets forming the Wild Weasel team.Wild Weasel missions were among the most dangerous missions flown over North Vietnam.